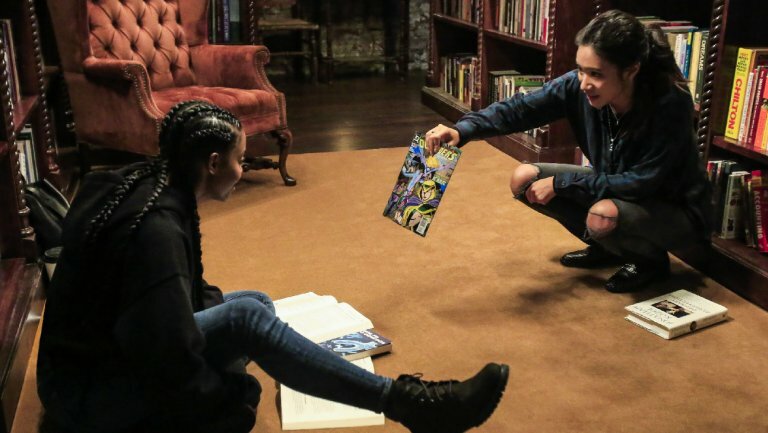 Thundergrace is the femslash ship between Anissa Pierce and Grace Choi from the Black Lightning fandom. The two women meet for the first time during the episode 1×03 (“Lawanda: The Book of Burial”), while Anissa is sitting in an ally of Grace’s bookstore. In 1×04 (“Black Jesus”), the ThunderGrace scene starts with Grace closing Ruby Red (the bar) with Anissa. As they talk about family, Anissa asks Grace if she’s ever wanted to share something important with her parents but she couldn’t; to which Grace replied “Yeah. You do know I’m bi, right?”. In episode 1×07 (“Equinox: The Book of Fate”), there is a brief scene where we see Anissa calling Grace and leaving a vocal message on her phone. She says that she hopes to grab a meal or a drink together, that she misses her and asks her to call her back when she gets the voice mail. This episode is the last one we heard of Grace in season 1. The second season seems inclined to give us more if these two. Anissa & Grace are portrayed by Nafessa Williams and Chantal Thuy.